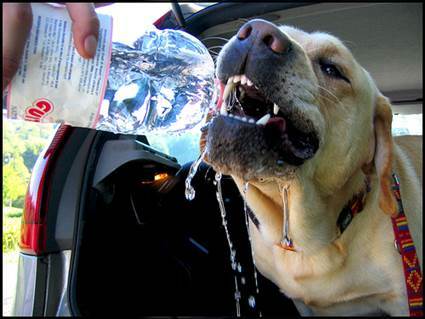 Most of the tips in the post “How to keep your dog cool when traveling“, could be applicable on cats too. The big difference in dogs and cats is that you often can’t decide over the cat as you can with the dog. The cat might not listen to your commands. 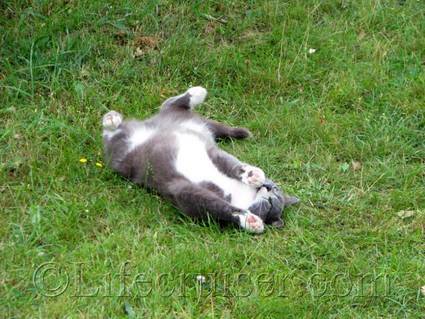 Here comes the differencies outlined and some other alternatives how to keep your cat cool. Generally I would not recommend traveling with your cat, but sometimes it’s necessary and also some cats may cope very well with it if getting use to it from an early age or not getting motion sickness/having any diseases. They are individs just like us. Check by doing some minor roadtrips before you leave on your longer one. The biggest problem you probably will face is to get the cat to drink water, so you can try to help your cat putting water drops around the mouth – or tongue if it’s hanging out – if possible. Be sure to bring your own tap water with you, because the cat might not drink from bottled water – you know how picky they can be. Put a wet towel over (or in a part of) the cat carrier to keep it shady and cool. Try to find a small fan driven by batteries and place it in front of the carrier to use if needed, but not not directly to the eyes of the cat to avoid drying the cat’s eyes out. 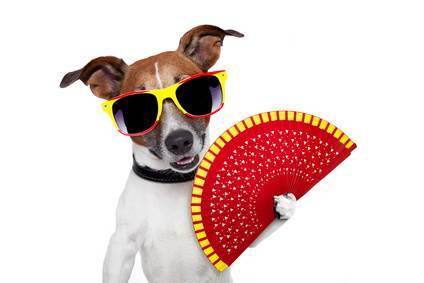 Except for the belly and the paws which is the same as for the dogs, also keep their outside of the ears and the armpits cool. Since it might be more difficult to cool down a cat with water, try using a misting spray instead. If the cat want to play, try throwing a couple of icekubes. Cats generally are better at finding cool places to lay down at by themselves than some of the dogs do. Place some cool bottles and see if the cat want to lay around them. You could also freeze them before you go travel to keep them cool during the trip, but don’t let the cat lay beside them when they are frozen without anything in between. To keep a cat cool at the hotel room, test if the bathroom is cooler than the rest of the room which it use to be. Also make sure your hotel room have airconditioning when you book it and check that it is working the first thing you do when you arrive. If not you have bigger luck when asking for a room with a working AC if you do it at once. When it comes to travel with other transport like buses, train or air, always ASK about all the conditions for the cat before booking anything and make sure you book with a responsible carrier. 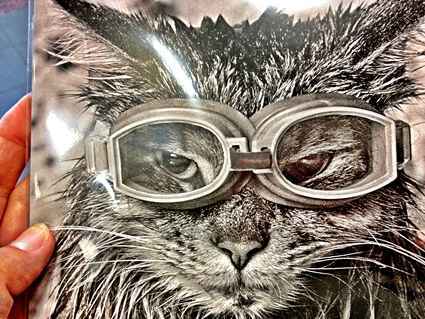 How do you know if your cat is dehydrated and overheated? Look out for the signs: unusual panting and drooling, lethargic, fever, vomiting, Diarrhea and muscle tremors among other signs. Wrap the cat in a wet towel, place the cat in cool place, put on a fan and try to get the cat to drink water but don’t force it. If you suspect your cat have had a heat stroke, even if you got it out of the primary danger, always let a Vet check it up, since there can be damages to inner organs if unlucky! Copyright © 2013 Lifecruiser. This Feed is for personal non-commercial use only. If you are not reading this material in your news aggregator, the site you are looking at is guilty of copyright infringement. 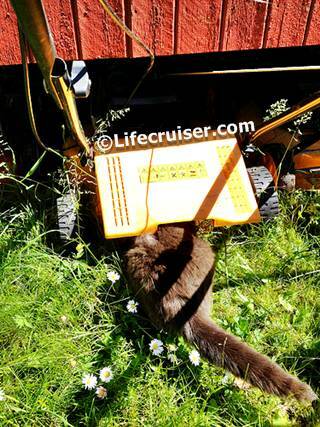 Please contact Captain Lifecruiser at lifecruiser.org so we can take legal action immediately. It’s definitely all about the moment, to catch so called “Kodak photo moments”. I love those kind of photos. Do you have any to share with us? Please do! Of course, I couldn’t resist it… I just LOVE crazy holiday postcards and especially unusual postcards like this one – and I don’t mind at all if they are in black and white like this one either! I found another working dog breed. The Portuguese Water Dog in the picture very proudly were modelling for me in this photo – with rights to be proud since it’s an ancient breed with a history back into 600 BC. Portuguese Water Dogs origins from the Algarve region in Portugal, where they have a very interesting history of herding fish into the fishermen’s nets, retrieve broken nets – even to act as couriers from ship or shores. It’s an excellent swimmer and distances as long as 80 km (in tempered water) is documented. It’s a fairly rare breed in Sweden, they occurred here for the first time around 1980, but has since then become very popular. 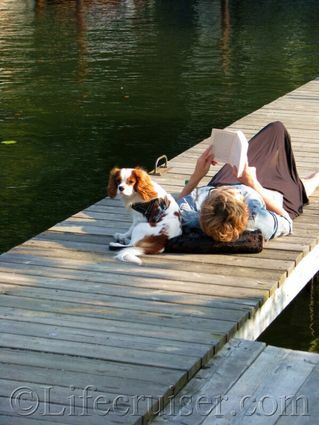 Today I’m having a day off from the internet, relaxing in Stockholm just like the woman at the pier in Långholmen with her pet dog and a good book. The water is the big lake Mälaren that is surrounding Stockholm and a bit beyond. To be around water always is soothing, don’t you think…? 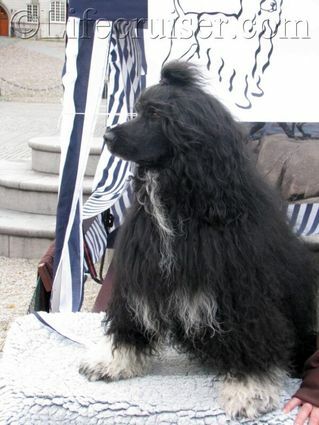 Going abroad you can meet a lot of interesting things, as the different dog breeds. 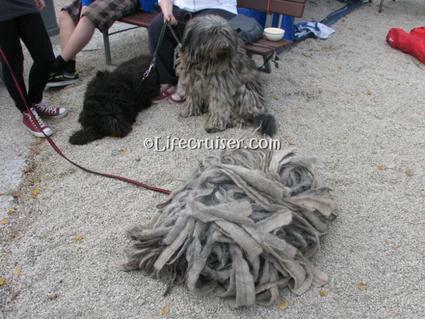 Meet this incredible Italian Bergamasco herding dog – yes, it IS a dog, not a mopping tool (lol)! They origin from the Italian Alps, near Bergamo – so no wonder they got an effective warming coat. 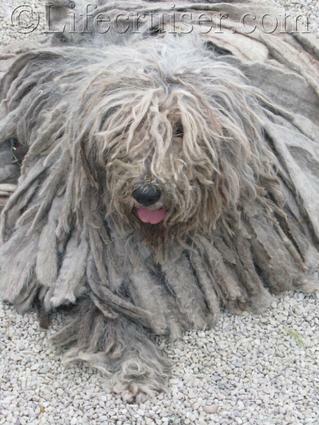 The Bergamasco’s were used to move the sheep herds and was mentioned first in literature from the 18th century. Though this Bergamasco in my photos I actually found in Stockholm. There is not a big number of them in Sweden, but they do exist even over here! Have a happy day everyone – and happy weekend too. 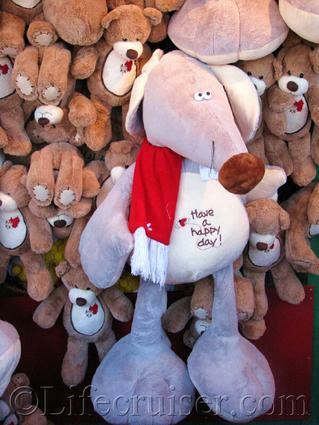 This was cuddly toys to win at the funfair Gröna Lund in Stockholm, the capital of Sweden. Have I told you before that Mr Lifecruiser is the very best at winning those kind of funfair toys for me? He always win something. I have to stop him, otherwise we would have our whole home filled with cuddly toys! Floyd, one of our favorites of the farm cats, has become quite fat this summer. It might have something to do with the creamy cheese he got from us… as well as all the food from the farmer. Whatever the reason are, he really knows how to relax and be the perfect holiday cat! Sometimes in the mornings we have company by Frida, one of the farmcats at our summer farm stay. She is waiting for us to make breakfast, but she seldom wants anything. She is often just being social. She is very friendly and social and runs after or at the side of the farmer all the time. almost like a dog. Very cute!